Plant If the juvenile foliage along with a more compact plant is preferred, cut off all the climbing stems that develop â€” this will keep it bushy and neat. The leaves will be arrow-shaped rather than the adult lobed style. As a young plant, its leaves start out heart-shaped, then gradually become arrowhead shaped as it matures. 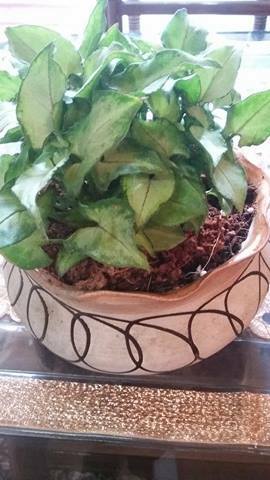 Its dark-green leaves have silvery white or cream variation, making this a decorative and popular house plant. Although it may be grown outdoors in some regions, the arrowhead plant is typically grown as a house plant. Common name Flower colours Bloom time Height Difficulty Nephthytis, Arrowhead plant, Arrowhead vine, Arrowhead philodendron, Goosefoot, African evergreen, American evergreen. - Rarely flowers indoors. 3.00 to 6.00 feet Easy. Planting and care It is easily grown is a house plant in warm, humidified areas. Prefers bright indirect light. Protect from direct sun. May be grown on a moss pole or in a hanging basket. Best grown in a soil based potting mix. Water regularly during the growing season, but reduce watering from fall to late winter. Likes high humidity, so consider sitting plant in a humidified room or place pot on a tray of wet pebbles. Sunlight Soil Water Temperature Fertilizer Bright, filtered light or Part shade. Any good potting mix. Use a container with good drainage. Keep the potting mix moist in summer, allowing the surface to dry out before watering again. Water less often in winter, letting the top half of the potting mix dry out. Normal room temperatures. 60-75Â°F/16-24Â°C. Feed every 2 weeks from spring through fall with a balanced house plant fertilizer diluted to half the normal strength. In winter, feed monthly. Care Arrowhead plant care requires humid conditions, especially during dry winter months. Mist the plant daily or place its container on a tray filled with pebbles and water to increase humidity for optimal growth. Keep them away from direct sunlight, as this will cause the arrowhead plant to burn or bleach. The arrowhead plant root structure is quite extensive, spreading and growing to the point of becoming invasive in the wild. Even within a contained environment, because of arrowhead plant root structure, the plant should be repotted every second spring. Special uses Special features: As a house plant, it is typically grown for its attractive ornamental foliage which changes shape as the leaves mature. Juvenile leaves (to 5.5â€ long) are ovate with heart-shaped bases and sometimes with silver variegation. Ornamental use: Hanging plant, twining or climbing, groundcover, potted plant when young. Display arrowhead plant alongside a group of other foliage plants or add it to a dish garden. Small plants mix well with compact peace lilies and English ivy because they require similar care.